In mid-June, Southern Calif.’s Metrolink launched PTC in a Revenue Service Demonstration across the entire 341-mile network the agency owns. There are currently 23 commuter railroads operating in the U.S. and only 29% of them are targeting to complete installation of positive train control technology (PTC) by the federally mandated deadline of Dec. 31, 2015, according to the American Public Transportation Association (APTA). Full implementation of PTC for all commuter lines is projected by 2020. PTC technology is designed to automatically stop or slow a train before accidents caused by human error occur, including train-to-train collisions, derailments caused by excessive speed and unauthorized incursions. While the status of PTC implementation across the industry is bleak, there are some bright spots. 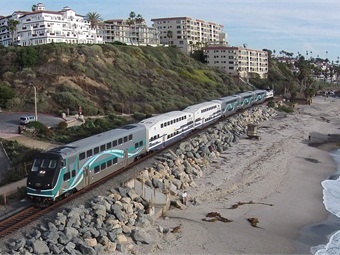 In mid-June, Southern Calif.’s Metrolink launched PTC into Revenue Service Demonstration (with passengers on board) across the entire 341-mile network the agency owns. This accomplishment makes it the first railroad in the nation to have PTC running during regular service on all of its hosted lines and remains on track to become the nation’s first passenger rail system to have a fully operational, interoperable, and certified PTC system in place. The current cost for developing, installing and deploying PTC on Metrolink totals $216.4 million, with funding coming from a combination of federal, state and local sources. Approximately 85% of the funds were state and local dollars. Another passenger rail network making significant strides with its PTC project is the Southeastern Pennsylvania Transportation Authority (SEPTA). 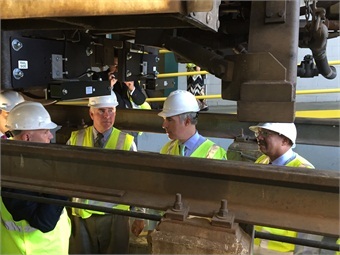 In July, members of Pennsylvania’s federal delegation (Sen. Robert Casey Jr. and Reps. Chaka Fattah, Pat Meehan and Ryan Costello) toured SEPTA’s suburban Philadelphia PTC testing facility. During the tour, the lawmakers viewed demonstrations of on-board and track-side PTC communication equipment and rode in technology-equipped railcars along a working test track. But positive stories about PTC are few and far between as many commuter rail systems struggle to overcome the numerous challenges posed by the expensive and complex undertaking. Ongoing challenges commuter railways face include, availability of the wireless spectrum. APTA has asked Congress to direct the Federal Communications Commission to provide free radio spectrum for PTC. “A number of transit agencies have been unsuccessful at completing negotiations with spectrum holders,” says Brian Tynan, APTA’s director, government relations. The limited number of suppliers of PTC technology is another hurdle. Those companies with proven capability to deliver the equipment in use in the U.S., according to a Federal Railroad Administration (FRA) report, include: General Electric Transportation Systems, Wabtec Railway Electronics Systems, Alstom Signaling Solutions and Siemens Rail Automation. Another challenge is the potential for radio interference. Differing technologies used by railroads operate with different communication protocols in similar frequency bands, which can lead to desensitization, according to an FRA report. Perhaps the greatest challenge with regard to implementation of the rail safety technology is how to pay for it. According to APTA, conservative estimates are that $3.48 billion is needed to implement PTC nationally on commuter rail. This does not include the cost of purchasing radio spectrum. So far, the industry has spent $950 million and Congress has only provided $50 million, says Tynan. The transportation advocacy group is calling on Congress to provide 80% of PTC costs on commuter railroads. Funding is one of the many issues Chicago’s commuter railroad Metra is contending with as it works to fulfill the PTC mandate. During his testimony before a Congressional subcommittee this summer, Metra Executive Director/CEO Donald Oreseno said implementation of the rail safety technology is expected to cost the railroad more than $350 million. In addition to the substantial upfront capital cost of PTC implementation, he said, the operating cost is estimated to be more than $15 million annually. “With all of these obstacles in mind, it should come as no surprise that no railroad has installed a fully functioning, interoperable PTC system to date,” Orseno says. When completed, SEPTA will have made a capital investment of $328 million and committed years of intense work to upgrade signals, communication systems, and vehicles to implement a viable and reliable PTC system across its 230-mile Regional Rail network. The authority shares almost 81 miles of track with four freight lines. Three of SEPTA’s 13 Regional Rail lines operate on Amtrak-owned track. Because a significant portion of SEPTA’s commuter rail system operates in Amtrak territory, the authority is installing Amtrak’s PTC technology — Advanced Civil Speed Enforcement System (ACSES). Adopting ACSES, however, presented SEPTA with an additional challenge on its West Trenton Line, which uses CSX track. CSX is installing IETMS, an entirely different PTC technology that is not compatible with ACSES. To resolve this major impediment, SEPTA and CSX agreed to physically separate their operations — SEPTA completed construction on its own track through CSX territory on the West Trenton Line in August. This additional PTC-related project costs $28 million and is partially funded with $10 million in federal TIGER Grant funding. To meet the Dec. 31, 2015 PTC deadline, SEPTA doubled its ongoing interlocking modernization and Automatic Train Control (ATC) installation efforts immediately following the passage of the Rail Safety Improvement Act. Using in-house forces to install ATC gave SEPTA the flexibility to simultaneously engage third-party design and construction contractors for ACSES installation. This concurrent approach to PTC implementation was not only cost-effective; it allowed SEPTA to successfully meet key PTC benchmarks while completing ATC installation in accordance with its PTC implementation plan. Meanwhile, the railroad industry awaits action on the Senate’s surface transportation bill, approved in July, which included a provision that would extend the federal deadline for railroads to install PTC to 2018. If no extension materializes, the FRA will enforce the Dec. 31, 2015, federally mandated PTC deadline. These fines and civil penalties, built into the regulation, can set a commuter railroad back as much as $25,000 a day. Potential violations outlined in the regulations include a fine of $15,000 to $25,000 for failure to equip locomotives. Members of Pennsylvania’s federal delegation (Sen. Robert Casey Jr. and Reps. Chaka Fattah, Pat Meehan and Ryan Costello) were given an up close view of SEPTA’s PTC technology during a facility tour in July. Additionally, he says there is concern about whether or not railroads can operate after the deadline. An example of a worst-case scenario come Jan. 1, would be if a freight railroad makes a determination that commuter rail service operating on the freight railroad’s tracks cannot continue, he explains. Another scenario would be that the commuter railroad itself determines that it cannot operate without having PTC fully implemented.